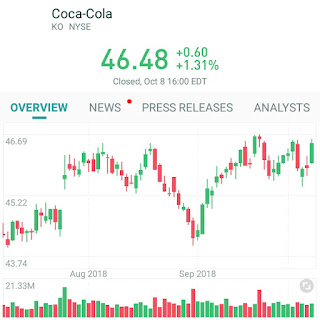 Coca-Cola Company (The) Stock Analysis Technical stock analysis for Mon 08'th Oct 2018 Buy candidate since 2018-10-08 Shorts 2.25% ( 2018-09-14 ) Cash 42 894.0 mill Loans 96 785.0 mill Beta 0.73 ROA 2.68 Access today's Top 5 Buy Candidates Coca-Cola Company (The) gained 1.31% in the last trading day, rising from $45.88 to $46.48 , and has now gained 3 days in a row. It will be exciting to see whether it manages to continue gaining or take a minor break for the next few days. The price has risen in 7 of the last 10 days and is up by 0.89% over the past 2 weeks. Volume has increased in the last day along with the price, which is a positive technical sign, and, in total, 1.06 million more shares were traded than the day before. In total, 9.75 million shares bought and sold for approximately $453.29 million. 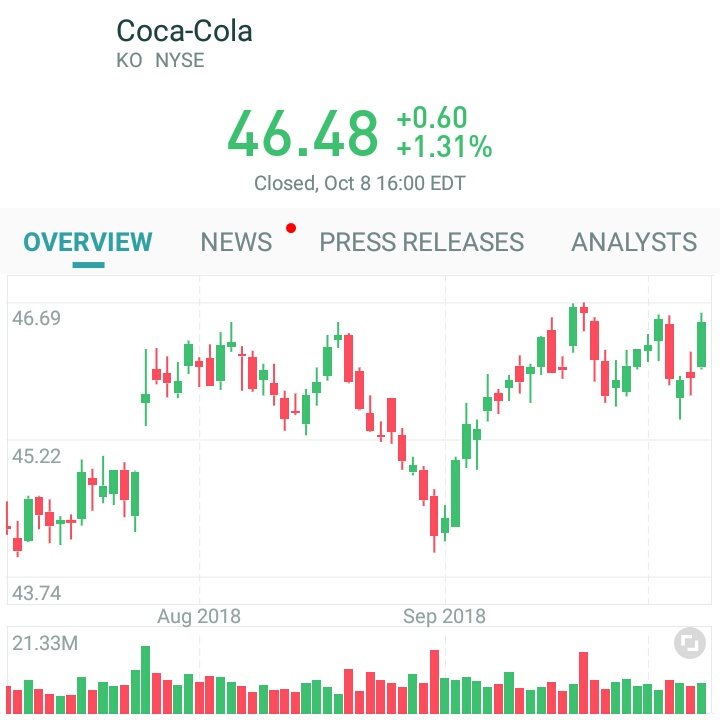 The 27 analysts offering 12-month price forecasts for Coca-Cola Co have a median target of 50.00, with a high estimate of 61.00 and a low estimate of 45.00. The median estimate represents a +7.57% increase from the last price of 46.48. The current consensus among 29 polled investment analysts is to Buy stock in Coca-Cola Co. This rating has held steady since September, when it was unchanged from a Buy rating.